Migrated to the United States from a small town in Monmouthshire, Wales called Trelleck, about 1818 and settled at Loretto, Cambria County PA. Ran a line of stage wagons hauling goods from Philadelphia to Pittsburgh before there was any railroad between the two cities.� The 1830 census for Cambria twp. Cambria show Wm. Lake to be under 40 yrs old, living by himself with no slaves or help. In the 1850 census Wm. and Ann are farming in Cambria with their children. 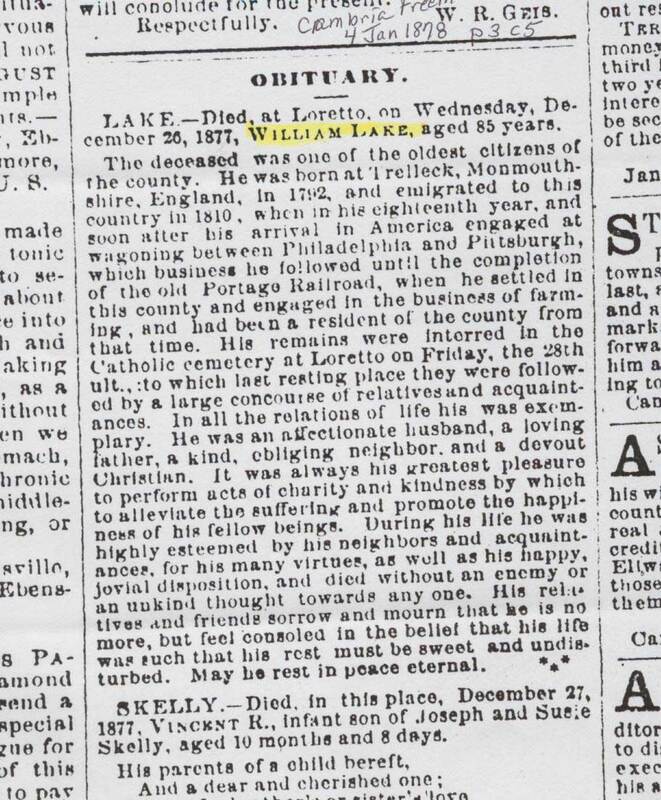 In the 1860 census William is living with four of his children in Loretto,� Cambria Co. PA. He is a widow.� William is a farmer with RealEstate and personal property each valued at $1000.� William can not read or write. William is living with Mary Jane who is keeping house, John who is studying law and Ellie in the 1870 census.� They are in Loretto. She was 31 when found in the 1870 census for Loretto, Cambria Co. PA.
Mary J. is living with her sister Theresa and her husband John Brown in Altoona, Blair Co. for both the 1880 and 1900 census. Occ:���������� Lawyer-Sworn to the Bar in Blair Co.� Sept 20, 1873. Her father and mother were born in Germany.� Matilda's occupation was housekeeper. Occ:���������� Seamstress working out of her home. She was 23 when found in the 1870 Census for Lorreto, Cambria Co. PA.� On the 1920 census for Cambria Co. PA she was living with nephews George and Demetrius Hogue on St. Thomas Street.